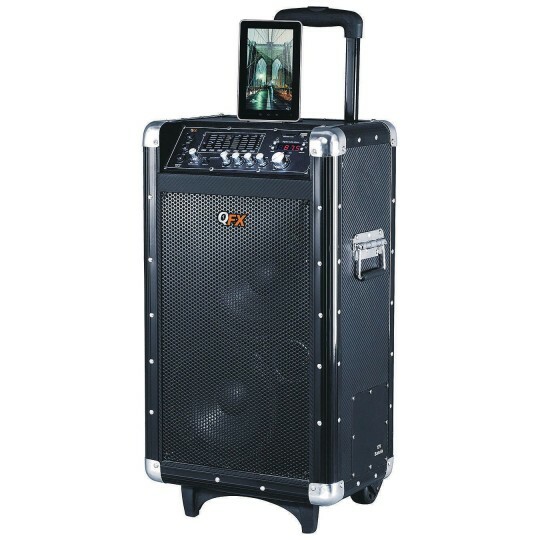 QFX portable amplifier speaker with long-lasting rechargeable battery that charges through AC or DC sources with included cable. Features a powerful 60W speaker and a Karaoke function (microphone not included). Includes USB Port, AUX-In ports, and Bluetooth connectivity. Measures 18” x 10” x 8.8” and weighs only 22 pounds. Built-in retractable handle and wheel make for easy portability. Batteries: 1 -12V batteries required (included). Includes remote. With standard usage, a fully charged battery can play for about 4-5 hours.